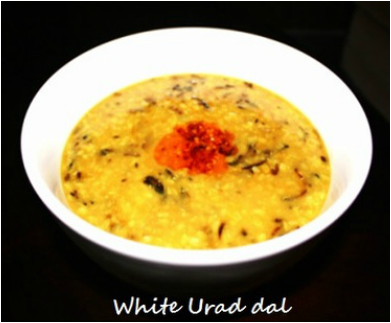 White Urad Dal is a whole or split urad with its skin removed. These lentils are creamy white in color and have a milder flavor than whole Black Urad Dal. It is very nutritious and rich in protein. White Urad dal is very easy and quick to make and the addition of different tadkas makes this dal very flavorful and delicious. 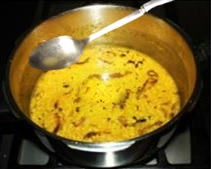 Urad dal is very popular in Punjabi cuisine. In south India, urad dal is used as a seasoning with mustard seeds for curries and making various dishes such as Idli, Dosa, and Vada. White urad goes well with tandoori roti, Missi roti (Black chick peas flour roti) and Naan. 2. 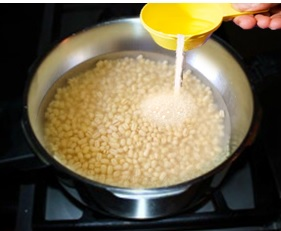 Once Dal is soaked rinse the water out and wash .
3. 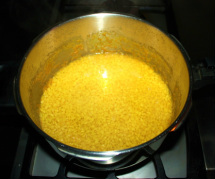 Add 3 cups of water, Turmeric powder, salt and 1 teaspoon of oil and mix. and cook for 3 to 4 minutes. 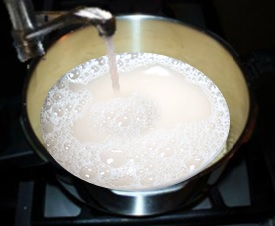 Turn the stove off and wait until steam goes down. Different brand of cooker required different time to cook. spoon mix dal well so there are no lumps. 9. 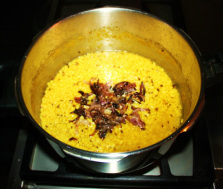 Add Onion Tadka and mix and cook for 3 to 4.
have the desired consistency of Dal. become dark brown. Turn the stove off. dark brown, turn the heat off.